Back in September 2013 I had the pleasure of a whistle-stop tour of Warwickshire County Council's Shire Hall and the old Crown Courts on North Gate Street in Warwick, Warwickshire. 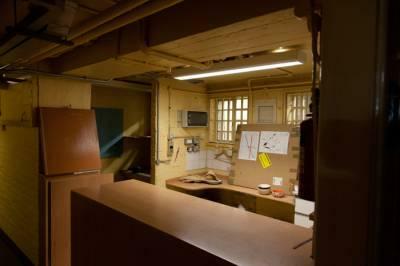 My friends and I have long been interested in the stories of the nuclear bunker that is supposed to be located underneath Shire Hall and the old gaol on Northgate Street, but because both are located behind closed doors a visit never seemed likely. That was until I met up with Jack Linstead of Warwick Rocks who also happens to work at Warwickshire County Council. I brought the subject up of the bunker and goal in conversation and he offered to show me around, naturally I had to ask if I could bring a few friends and gladly he obliged. On the day our first port of call was the "much fabled nuclear bunker" which was somewhat of a disappointment because it looked like any old dull office space (see picture above), but it did have an impressive double blast door (which I didn't take a photo of) and an emergency exit tunnel and hatch. Jack said that the bunker was still in use for county emergencies such as the 2007 floods. After we left the bunker we climbed the several flights of stairs back up to the foyer of the building, next we had a quick look at the council chamber which was interesting to see a I had never been in there before. Its quite a dark room because of its location in the centre of the building, also the main natural light source at large stained glass window was blocked off in recent renovations that brought the post office and other council services into the foyer next door. 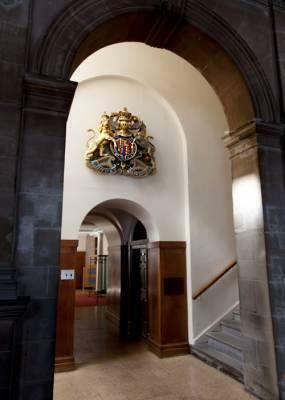 Next we where shown through the corridor which links Shire Hall with the old Warwick Crown Court on Northgate Street. The entrance hall and waiting room for the court rooms is spectacularly ornate, its such a shame that this building is no longer in public use and also a shame that the modern replacement in Leamington Spa is so bland in comparison. The opulent interior style continued into the court rooms, the court rooms are very ornate I particularly liked the ceiling decoration and the lantern on the top. I would have liked to explore the room a bit more but Jack was on his lunch hour so we had to rush on into depths of the prison cells beneath. The cells and gaol were the main event of our visit as far as I was concerned I've heard rumors of the gaol located here and seen pictures but we were actually going to go inside it so it was quite exciting. First we went down the steps and along the corridor to the office where I guess the keys for the cells would have been kept. At this point it was interesting to imagine all the prisoners over the centuries would have walked down this corridor to learn their fate in the court rooms above. At this point we had a look around the cells, I guess these cells are as old as the courts above with very basic modern upgrades such as the stainless steel and wooden shelf seen in one of the cells I looked in. In terms of comfort there were no windows, no toilet, not much space and only a few holes in the wall for ventilation, but in comparison to what prisoners of the 1700's had to deal with this was paradise. After we had a brief look around the cells, Jack opened up a very old looking door from which stone stairs lead downwards into the goal below which came out of use in 1797. 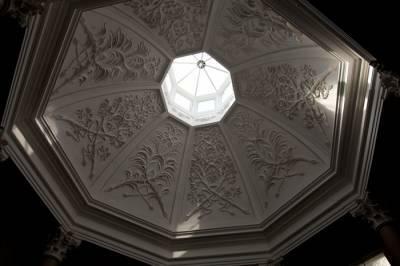 The room itself is octagonal just like the court rooms above. In the middle of the room is a cess pit, surrounding this are eight posts that prisoners would have been tied to by there feet. The room is was very damp, with a grate in the centre of the roof for light, other than the cess pool and posts the room is bare, prisoners would have had to lye or sit on the damp stone floor. On one side of the room is a brass plaque that was installed in 1932 with a history of the room written on it by the time I had read it, it was time to go and before we new it we were outside on Northgate Street. It was a very quick tour lasting only half an hour but we saw some hidden history that lies very close to public areas but remains hidden from view. I do not know what the plans are for the old Crown Court but I hope its opened to the public as it really is a fantastic building with a fantastic history.